Vintage Jetsons Blue Turquoise Purple Barkcloth Coasters - GREAT Gift Idea - Ceramic Tiles - Set of 4 - approx 4" x 4"
Barkcloth Coasters - Jetsons - Blue Turquoise Purple - Ceramic Tiles - Set of 4 - approx 4" x 4"
Something NEW at Atomic Livin Home! I CAN MAKE THESE WITH JUST ABOUT ANY FABRIC FROM MY SHOP! JUST ASK! 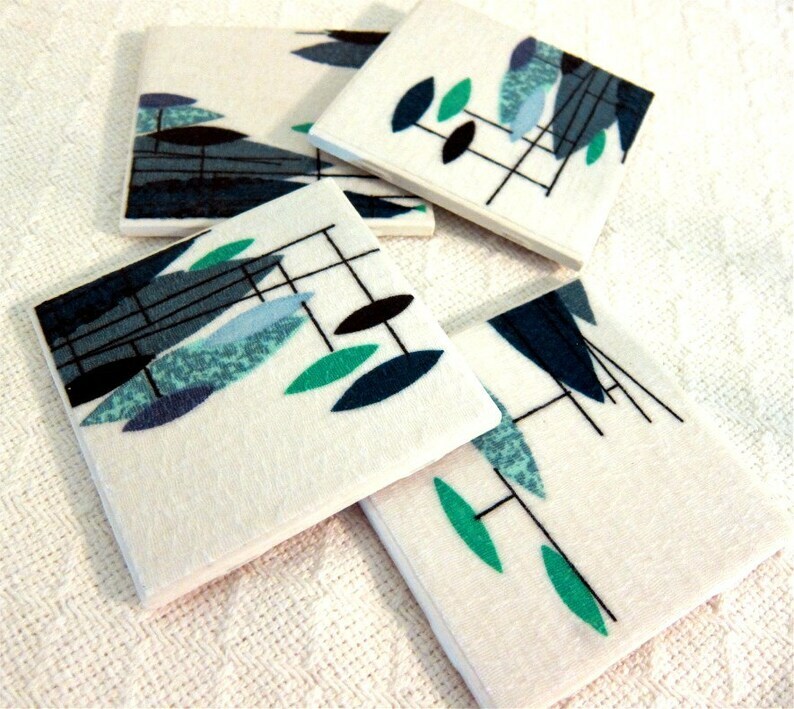 Retro Ceramic Tile Drink Coasters!! ...or tile for your backsplash....or mini canvases of retro art goodness! Place them in a group against a wall or on a shelf, they look lovely in little plate stands, too! Set of 4 tile coasters with vintage barkcloth on top and cork on the back to protect your retro furniture! Fabric is adhered to ceramic tile and several coats of exterior polyurethane are applied to make them water resistant and beautiful! LOOK FAMILIAR? ?...They should! I make them with the same fabrics I use for my famous Retro Pillows!! NOTE: Pattern may vary from photos, yet still look fabulous, as I cut each set from my gorgeous fabrics to get the most interesting parts of the pattern! And,as always, everything I sell comes with a 100% Satisfaction Guarantee! Shipping costs are outside of my control. I only charge what Etsy Shipping charges me, which is less than USPS. The weight of the package is approx. 1# 14oz. and measures approx. 7" x 7" x 6". Shipping is via Priority Mail per USPS weight requirement. Shipping outside the USA is First Class International. If you'd prefer faster delivery, choose Priority Mail International. If buying more than one item, contact me for combined shipping charges. I always try to save you money on shipping! Vintage Jetsons Retro Barkcloth Coasters - Great Gift Idea - Orange, Brown, Off White - Ceramic Tiles - Set of 4 - approx 4" x 4"
Vintage Starlight Room Barkcloth Coasters - GREAT Gift Idea - Ceramic Tiles - Set of 4 - approx 4" x 4"
Retro Celestial Coasters - GREAT Gift Idea - Ceramic Tiles & Barkcloth - Aqua, Teal, Turq., Gold, Red -- Set of 4 - approx 4" x 4"
Mod Century Atomic Mobile Drink Coasters - Great Gift Idea - Ceramic Tile & Barkcloth - Blue, Red, Grey - Set of 4 -- approx 4" x 4"
Retro Barkcloth Drink Coasters - GREAT Gift Idea - Barkcloth & Ceramic Tile - MCM Mobiles - Set of 4 - approx 4" x 4"
Modern Coasters - Spice Loops - GREAT Gift Idea - Ceramic Tiles & Chris Stone Fabric - Set of 4 - approx 4" x 4"
Geometric Mondo Lime Coasters - GREAT Gift Idea - Ceramic Tile & Barkcloth -- Set of 4 -- approx 4" x 4"
These look even more beautiful than I’d expected. Really happy with my purchase! Retro Coasters - Jade Green Blue Beatnik Guitars 11950s - GREAT Gift Idea - Ceramic Tiles & Fabric - Set of 4 - approx 4" x 4"
Retro Barkcloth Drink Coasters - GREAT Gift Idea - Barkcloth & Ceramic Tile - Crimson Red - Set of 4 - approx 4" x 4"
Atomic Vintage Barkcloth Coasters - 1950's Spacely Sprocket Fabric on Tile - GREAT Gift Idea - Ceramic Tiles - Set of 4 - approx 4" x 4"
Modern Coasters - Aqua Loops - GREAT Gift Idea - Ceramic Tiles & Chris Stone Fabric - Set of 4 - approx 4" x 4"
Retro Barkcloth Hawaii Lounge Coasters - GREAT Gift Idea - Barkcloth & Ceramic Tile - Deep Teal, Lime Green - Set of 4 - approx 4" x 4"
Vintage Atomic Barkcloth Coasters - GREAT Gift Idea - Avocado, Red and Black - Ceramic Tiles - Set of 4 - approx 4" x 4"